The term wild dog is used to describe pure-bred dingoes, feral/escaped domestic dogs and their hybrids. Both dingoes and wild domestic dogs are the same species, Canis familiaris. Wild dogs are a major pest species impacting on grazing industries across mainland Australia. 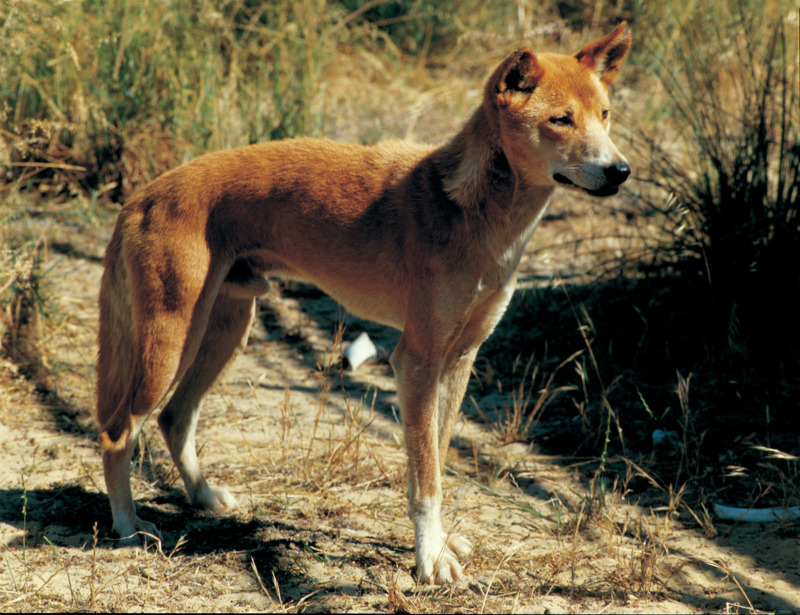 Since arrival in Australia domestic dogs have interbred with dingoes and most wild dog populations now include some level of hybridisation. The extent of hybridisation across the country broadly reflects the intensity of human settlement. In Western Australia over half (59%) of wild dogs have tested as ‘pure’ dingoes. Within populations of wild dogs there is a low proportion of purely domestic dogs. Wild dogs occur where there are suitable supplies of food and water. They are absent from most of the closely settled farming areas of the south-west, though may still be found in some forested areas. In grazing areas wild dogs are subject to management programs because of their predation of livestock. Wild dog predation on livestock is taking a heavy economic and emotional toll on livestock producers in affected pastoral and agricultural areas. In addition to significant annual stock losses to wild dogs, their threat is a major deterrent to restocking of livestock enterprises and to associated regional development opportunities, such as transport and shearing services. Stock losses from wild dogs in the rangelands of Western Australia alone are estimated at $25 million per annum. Small stock are extremely vulnerable to the impacts of wild dogs. When wild dogs move into sheep paddocks they harass, bite and kill sheep, often without eating any. This behaviour appears to be a response to the presence of an abundant and panicky prey in flight. Predation of sheep can be recognised by the type of damage caused. Refer to the Wild dog predation of sheep web pages to learn how to recognise wild dog attacks. Cattle are considered to be able to withstand wild dog attacks to a greater extent. However, groups or packs of wild dogs may attack and kill young cattle. Considerable variation in losses of calves have been recorded ranging from negligible to significant in some areas. Wild dogs, that is dingoes, feral dogs and their hybrids are declared pests for the whole of Western Australia under section 22 of the Biosecurity and Agriculture Management Act 2007. The Western Australian Organism List (WAOL) describes the control and keeping categories and the areas in which this pest is declared for each of the following groups: dingoes, dingo hybrids and feral dogs (Canis familiaris). Dingoes are considered native wildlife under the Biodiversity Conservation Act 2016 (BC Act). An exemption order made under section 271 of the BC Act exempts people from the requirement for a licence for activities involving dingoes. While the exemption order includes an exemption for the use of prohibited methods and devices listed under the BC Act in relation to taking or disturbing of dingoes, this does not mean that any method or device can be used without authorisation and the provisions of the Animal Welfare Act 2002 still apply in relation to cruelty. See the section below on control methods that may be used. Western Australia’s policy for wild dog management is to control all wild dogs, including dingoes, in and near livestock grazing areas in Western Australia. In other areas dingoes are left undisturbed. The management of wild dogs in WA is guided by the Western Australian Wild Dog Action Plan 2016-2021 (WDAP), which aims to facilitate a more coordinated and well-resourced approach to wild dog control in Western Australia. The action plan can be downloaded from this page. The WDAP is part of the WA State Government's long term commitment to wild dog control. This includes management of the State Barrier Fence by the Department of Primary Industries and Regional Development (DPIRD). Through a previous $10.6 million investment of Royalties for Regions funding, new fencing was installed to fill a 170km gap, and all of the fence was upgraded to wild dog standard. The WDAP includes further funding for the proposed 640km Esperance extension, if approved. DPIRD also supports industry and landholders in wild dog control through biosecurity groups. Recognised Biosecurity Groups (RBGs) have the option to collect Declared Pest Rates to fund declared pest control, including wild dogs. These rates are matched by the State Government. DPIRD administers the Declared Pest Account in which these funds are received, held and allocated. DPIRD has a further key role in ensuring the safe use of restricted chemical products (such as 1080 and strychnine) for their ongoing use by industry for the control of pests, including wild dogs. Under the Biosecurity and Agriculture Management Act 2007 landholders - landowners and occupiers - are responsible for wild dog control on their own land. However, for vertebrate animal pest control, everyone must ensure they use the most humane method available (see animal welfare, baits and poisons). There are a number of control options available, including ground and aerial baiting with meat poisoned with 1080 (sodium fluoroacetate), canid pest ejectors, trapping using strychnine, fencing and to a lesser extent, trapping and shooting.